Sunday, June 14 marked the 45th anniversary of LA Pride, the largest LGBT celebration in Southern California. The event's iconic parade is one of the most inclusive in Los Angeles, bringing lesbian, gay, bisexual, straight, transgender, and cisgender people from across the state to march for freedom and acceptance for all. The parade also included hundreds who extend the "all" category to nonhuman animals. For the fourth year in a row, many walked with my organization, Mercy For Animals, behind a rainbow banner that reads, "No one is free while others are oppressed." Each year we have been greeted with enthusiastic cheers and applause, and this parade was no different. This is a heartening sign that social justice movements are beginning to appreciate that those we fight for share important similarities--and that we as advocates share the very same goals. Empathy, I've discovered, is an abundant and renewable resource, one we no longer reserve for a select few people or causes. I learned this first-hand six years ago as I recovered from an anti-gay hate crime--an unprovoked assault in which a complete stranger beat me to the ground, shattered my nose, fractured my skull, and left me bruised and bloody. The night I was attacked, I saw the very darkest side of humanity. In the weeks that followed, however, expressions of sympathy in every form flooded my bedside from kindhearted people around the world. This outpouring of love and generosity--often from total strangers--revealed the tremendous breadth to which human empathy can extend. My own pain also made the suffering of others seem more real, and less like an abstract concept. Whether experienced by a woman, man, child, dog, or pig, pain is head-pounding, teeth-grinding, "make-it-stop" real. Following my experience, I found that I connected on a deeper level with the animals we humans physically and mentally abuse and kill--simply because we view them as different. We now know, however, that they are similar to us in all the ways that truly matter. Like us, the animals we raise and kill for food experience joy, suffering, pleasure, and fear. They delight in the company of their mothers, children, and companions and mourn their loss. But the vast majority of them are ripped away from their families to endure endless abuse on factory farms. Pigs, cows, chickens, and other farmed animals are subjected to painful mutilations without anesthetic, intense confinement in cages for weeks or months on end, and brutal, excruciating slaughter. We'd never wish this torture on our worst enemies--let alone our beloved cats and dogs. In a talk based on his book The Empathic Civilization, economic and social theorist Jeremy Rifkin argues that over the course of history, humans have enlarged our sphere of empathy to include broader and broader swaths of society, beginning with blood relatives and widening far enough today to encompass those with whom we share no recent ancestors, religion, or nation. "When we talk about building an empathic civilization," he says, "we're talking about the ability of human beings to show solidarity, not only with each other but with our fellow creatures." This line of thought makes clear that social justice movements--those intended to spread empathy toward the oppressed and marginalized--are not distinct, isolated causes. Rather, they are all part of a single, age-old effort to transform "them" into "us." The compassionate people who cheered us on as we marched through West Hollywood understand this. They understand that both the LGBT movement and the animal protection movement are about creating a world where no one will be abused, hurt, or killed simply because of who they are, and about ensuring everyone has the right to basic bodily liberty. Most of all, they are about questioning the way society labels many individuals as "other." 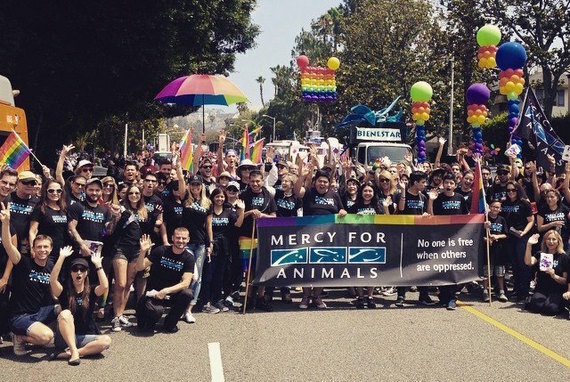 At the LA Pride Parade, Mercy For Animals walked in solidarity with everyone who faces oppression. The sooner we widen our circle of compassion to embrace those who are different from us--including those with four legs, wings, and fins--the better off we all will be.